When we assess left ventricular systolic function with echocardiography, we usually think in terms of left ventricular ejection fraction. But there are many other indicators of left ventricular function, some of which are rarely used. One of these is E-point septal separation, or EPSS. 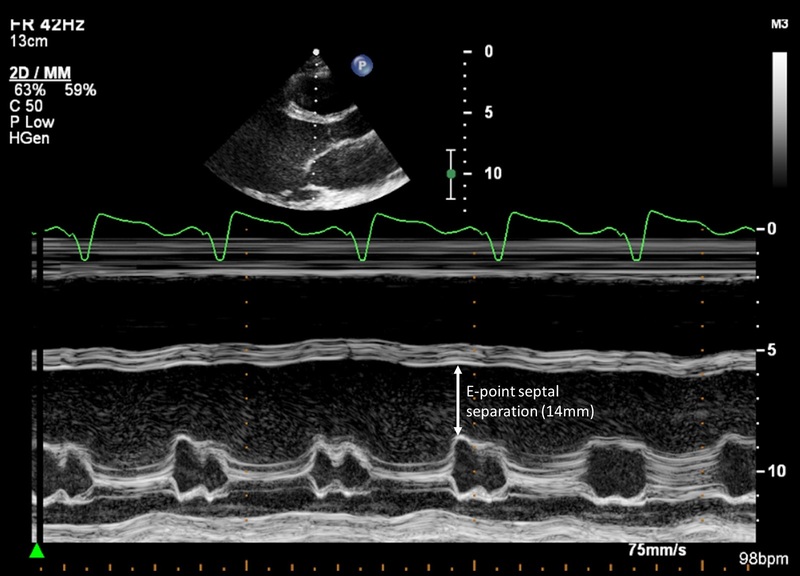 EPSS refers to the distance between the anterior leaflet of the mitral valve and the interventricular septum during early diastole. This is easiest to measure using M-mode echo, and the measurement is taken when the anterior mitral leaflet is at its closest to the septum (see image). Normally, the EPSS is no more than 6mm. The distance gets bigger with worsening left ventricular systolic function, and an EPSS >7mm is a sensitive measure for severely impaired systolic function. What is the mechanism underlying the EPSS method? 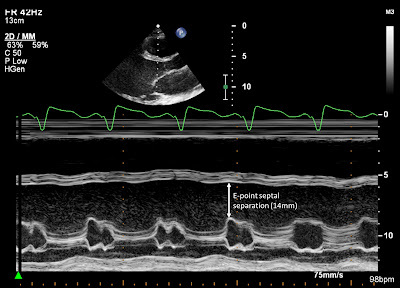 The increase in EPSS in left ventricular systolic dysfunction is partly because of ventricular dilatation causing the separation between the anterior mitral leaflet and the septum to increase, but also because of a reduced transmitral flow volume causing the mitral leaflets to open less widely during diastole. So an increased EPSS is a surrogate marker of impaired left ventricular systolic function. However, you can't use EPSS in mitral stenosis or aortic regurgitation (both of which will falsely increase the EPSS because the anterior leaflet opens less fully), nor should it be used in the presence of septal hypertrophy (which tends to falsely reduce the EPSS). McKaigney CJ, Krantz MJ, La Rocque CL, et al. E-point septal separation: a bedside tool for emergency physician assessment of left ventricular ejection fraction. Am J Emerg Med 2014; 32: 493-497. The mitral valve is normal in structure but hardly opens....it's like 'Functional Mitral Stenosis'! Q.now with 3D & 4D images as well as CMR, do you still use "M mode"?